Try a restaurant-quality recipe your family will love. Chicken Apricot Bake fills the kitchen with a fragrant promise of deliciousness for dinner. In a large bowl, combine stuffing, apricots, pecans, brown sugar, thyme, salt and pepper and hot water. Spread evenly in a greased 11 x 7-inch glass baking dish. 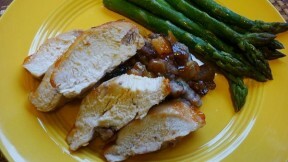 Place chicken breasts on top and spread the apricot preserves over each breast. Sprinkle a little garlic salt on top. Bake in a 350-degree oven for 45 to 50 minutes, or until chicken is no longer pink inside.